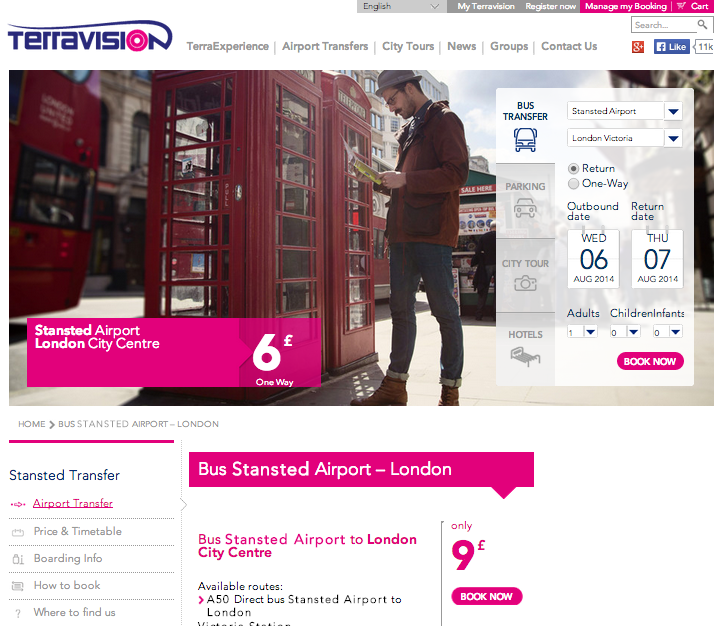 Terravision is a popular low cost bus company helping tourists and travellers get from Stansted airport to central London and the opposite, quickly and cheaply. Beyond this, they offer cheap parking at certain airports, as well as stays in different parts of Tuscany and Spain, and tours around dozens of cities around the world. With trips that are considerably less than £10 per person, Terravision seems to be the cheapest transport from London Stansted Airport to central London. Ability to become part of the Terravision franchise– gain organisational/technical support when starting up, high brand awareness and profile, and excellent produce when setting up your own Terracafé or venue. With some of the cheapest prices around considering what they do, and surprisingly few complaints in an industry where a lot can go wrong, Terravision seems a good low cost bus company to go to when planning a holiday, saving up pounds that can be better spent elsewhere. Terravision is very popular amongst Italians and Spaniards.